b) The effects of variations in UV upon energy absorption in the Ozone Layer. c) Thermal heating of the Stratosphere by the solar wind. But what if there another mechanism that was responsible for this amplification? 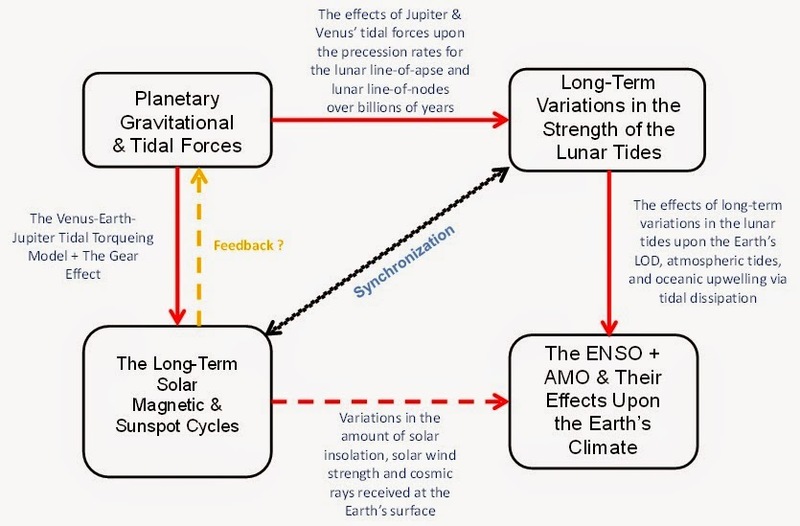 This particular model claims that the "amplification" is actually caused by the effects of long-term variations in the lunar tides upon the Earth’s LOD, atmospheric tides, and oceanic upwelling (via tidal dissipation). The model further claims that it is the tidally induced changes in these parameters that effect the Earth's climate through their long-term influence upon the ENSO and AMO. According to this model, it is the periodicities in the planetary gravitational and tidal forces that are determining the long-term periodicities that are observed in the level of solar activity as well as the long-term variations that are seen in the strength of the lunar tides (as experienced on the Earth). This produces a natural synchronization between the changes in the Earth's climate that are caused by the Sun and those that are produced by the Moon. The model proposes that it is this synchronization between these two drivers of long-term climate change that is the cause of the amplification.